The ice storm that struck Augusta, Georgia 2 weeks ago showed how nature can drastically change the environment within a short period of time. 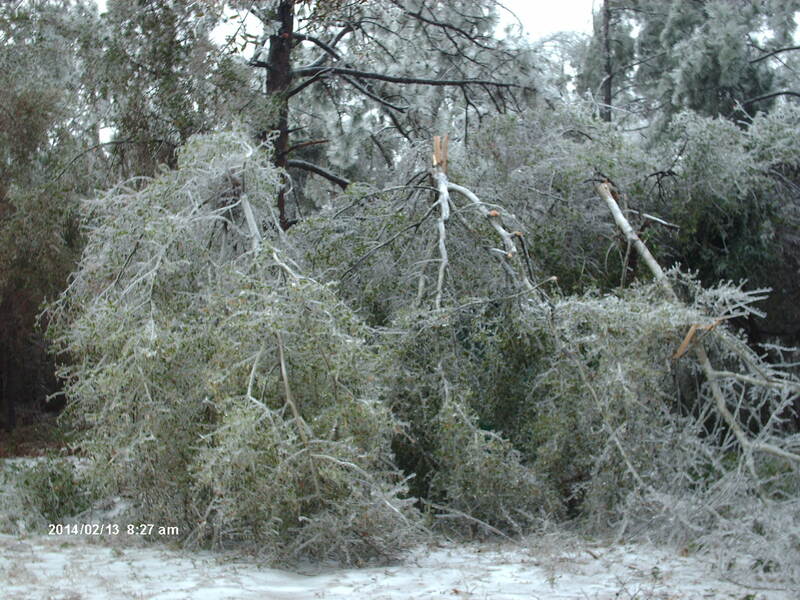 The weight of the ice busted trees in half, brought down tons of branches, and even felled large mature trees. The constant crack and thunder of trees and limbs falling lasted all day and night. In our modern world, humans will pick up and dispose of most of this debris, but before man tamed the wilderness, an ice storm such as this could have transformed a close canopied forest into an open woodland or even a savannah. My backyard after the Ice Storm. The black cherry tree and sand laurel oak on the right cracked in half under the ice. The sand laurel oak on the left is bent over but has since bounced back. The weight of the ice made this tree tip over also. Note how the roots are yanked from the ground. Many branches just broke off and fell. This woody tissue will dry and become flammable. A forest is defined as an environment with 80% canopy coverage; a woodland is an environment with 50%-80% canopy coverage; and a savannah is an environment with less than 50% canopy coverage. A reduced canopy coverage will result in more sunlight reaching the ground, altering the plant species composition. More grass, herbs, shrubs, and shade intolerant tree saplings can then grow in the sunnier conditions. This in turn influences faunal composition. 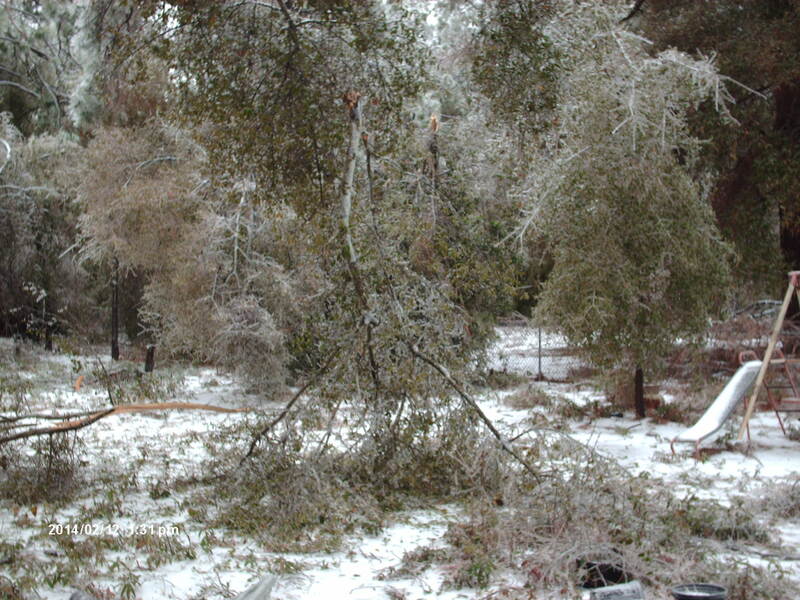 An ice storm by itself can reduce canopy coverage, but the flammable debris left behind can become an even greater factor that reduces canopy coverage. A summertime drought following a winter ice storm can dry all the fallen wood littering the forest floor. During droughts, weather fronts often produce disturbances I like to call “constipated thunderstorms” when there is a lot of lighting but little rain. The lighting can ignite forest debris causing a fire that kills even more trees, leaving only the strongest specimens standing. Fire resistant species such as oak and pine are favored in this kind of scenario. The mature open woodlands of southeastern North America were always shaped by fire and ice, until man changed this natural pattern of landscaping. 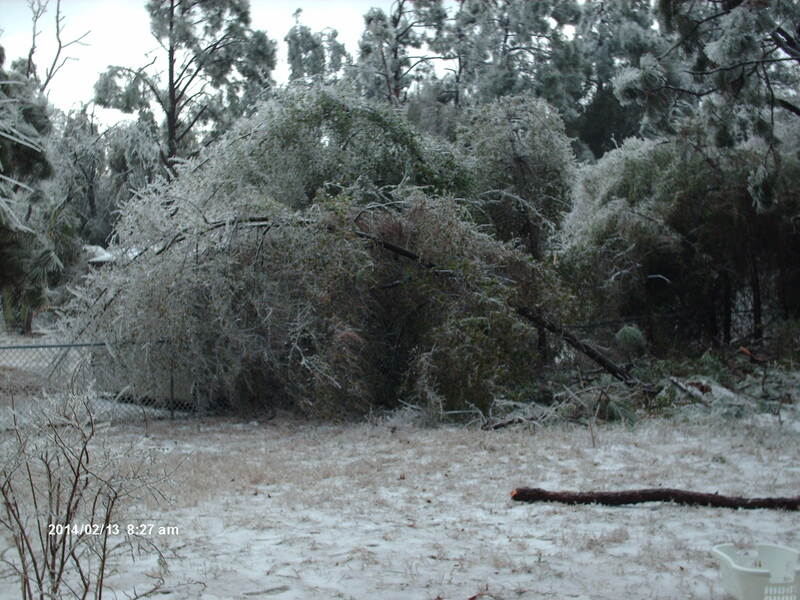 Under our present climatic conditions, major ice storms strike the mid-south about once every 10 years. During the Pleistocene, the frequency of ice storms likely varied but probably occurred during all climatic phases. I hypothesize ice storms were most frequent during interstadials–the warm phases within Ice Ages. Average temperatures then were slightly cooler than those of today, and glaciers were melting, allowing enough atmospheric moisture for ice storms to occur. Average temperatures were even cooler during stadials, but there was less atmospheric moisture because glaciers were expanding and locking water in ice. Stadials in the mid-south may have even had a lower frequency of ice storms than in the present climatic phase. There were probably some climate phases when ice storms occurred on an annual basis in the mid-south, and this created more open environments that would have particularly favored grass-eating megafauna such as mammoths, bison, and horses. The fallen woody debris from an ice storm provides habitat and foraging opportunities for wildlife. Termites, beetles, and carpenter ants invade rotting wood. Carpenter ants don’t actually eat the wood, but they tunnel into it and build nests. (Carpenter ants mostly eat sugary aphid secretions, nectar, and dead insects they scavenge off the forest floor.) Lizards and snakes lay their eggs in the rotting wood. Woodpeckers attack the debris and prey upon the arthropods living in the piles of fallen wood. Raccoons, possums, and bears feast on the high protein snacks they find in the fallen logs. If a fire doesn’t incinerate this organic material, eventually it is consumed by microorganisms and transformed into soil. The fallen wood from the ice storm will make abundant homes for colonies of carpenter ants (Camponotus pennsylvanicus). The ice storm will provide a feeding bonanza for pileated woodpeckers (Drycopus pileatus) in a few years. They can eat an entire colony of carpenter ants. Here, one is probing for ants and beetles with its long tongue. 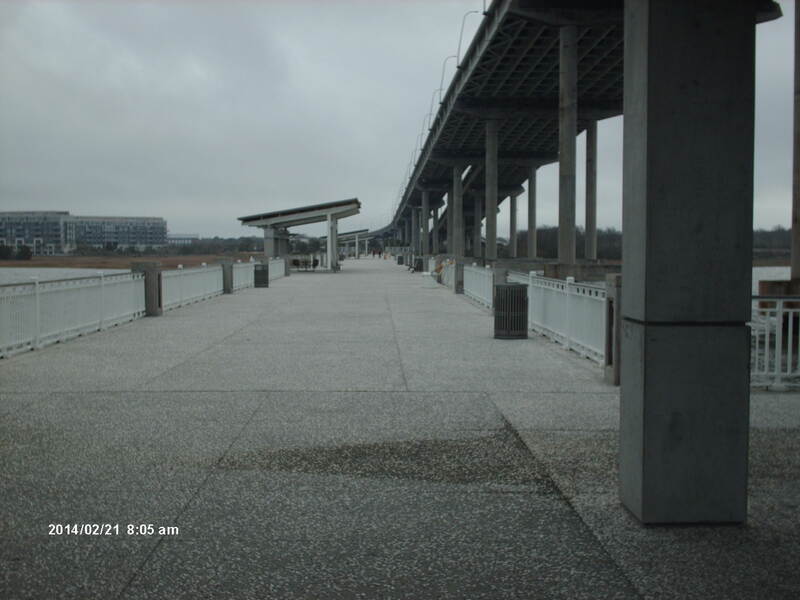 A few days after the ice storm, I experienced an earthquake. I heard a loud roar lasting for at least 15 seconds, and I felt the ground shake in alarming fashion. At first I thought it was yet another tree falling under the weight of the ice but soon thereafter realized that it had been an earthquake, unrelated to the ice storm. The fault is many miles deep, and the ice could not have influenced it. Its occurrence was a coincidence. The epicenter of the earthquake was Edgefield County, South Carolina, and I was staying in Evans, Georgia with my parents because our power was still out. (It took Planters Electric 129 hours to restore our power.) Evans is about 40 miles from Edgefield County. I was able to correctly determine the direction of the earthquake from where I was sitting and watching television. My wife and I splurged for our 20th wedding anniversary and spent 2 days at Point Pleasant, South Carolina located across the Ravenel Bridge from Charleston. Our vacation gave me the opportunity to visit the Charleston Museum. This institution owns hundreds of locally found Pleistocene vertebrate fossils but much to my chagrin they only have 1 display case devoted to my obsession, and the museum curator wasn’t present, so I couldn’t ask him to bring out the rest as I had planned. I noticed 2 errors in the display case. A ground sloth toe claw was labeled as belonging to a Megatherium americana. 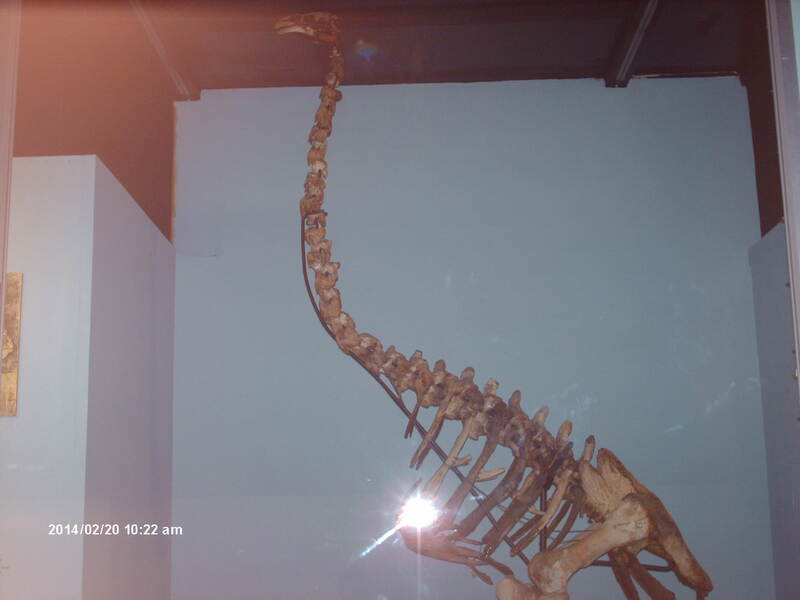 The label wrongly stated that Megatherium lived in South Carolina. Megatherium was restricted to South America. The toe bone claw likely belonged to an Eremotherium laurillardi, a species common to the the coastal plain of southeastern North America until about 30,000 BP. There were 3 megalodon teeth in the case, but this giant great white shark became extinct before the Pleistocene. The display case also holds fossils of a mastodon lower jaw bone and teeth, a mammoth tooth and partial tusk, a bison horn, a llama bone, a giant beaver tooth, and a dire wolf lower jaw and teeth. All the below photos can be enlarged by clicking on them. 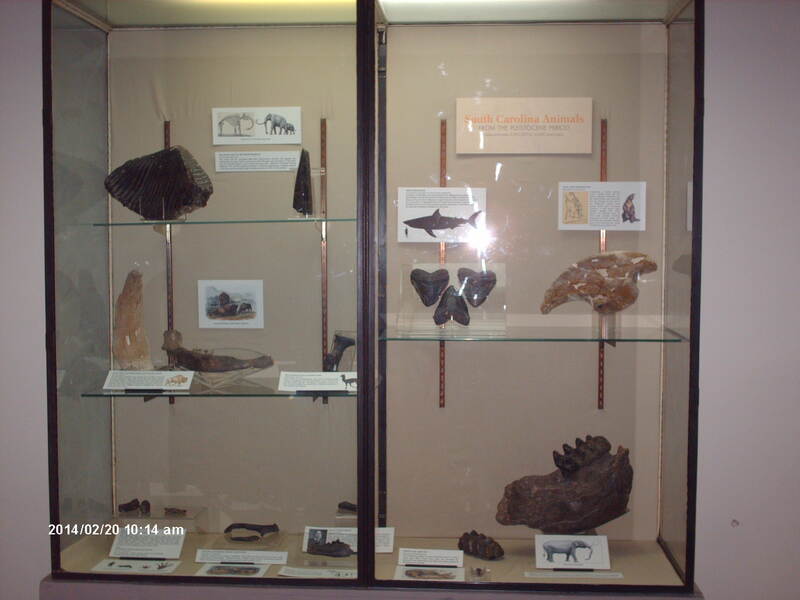 The Charleston Museum has hundreds of locally found Pleistocene vertebrate fossils but only keep about 15 on display. I wish they would have had all of them on display but I guess Civil War stuff is more popular, and they choose to make space for that. In contrast to the meager display of Pleistocene fossils, the avian collection is quite extensive and excellent. They also have mounted taxidermic specimens of North American mammals, including the largest polar bear on record, a subject I already discussed on a previous blog entry (See https://markgelbart.wordpress.com/2012/12/10/bearzilla-the-biggest-bear-in-history/). 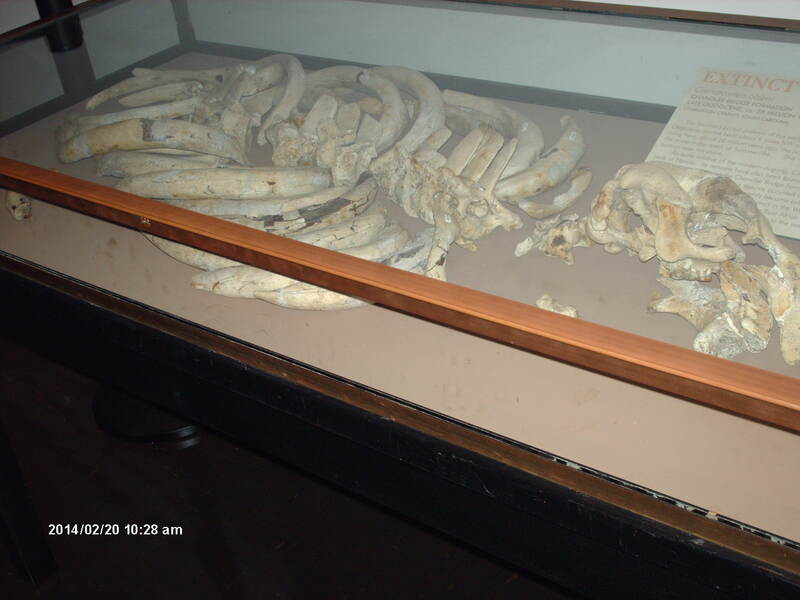 The polar bear specimen has no connection to Charleston, other than the museum has possession of it. Gavialosuchus carolinensis lived in southeastern North America during the Oligocene 33-25 million years ago. It was a large saltwater crocodile with a long snout and it may or may not be closely related to extant gavials native to modern day India. Their evolutionary relationship to living gavials is in scientific dispute. 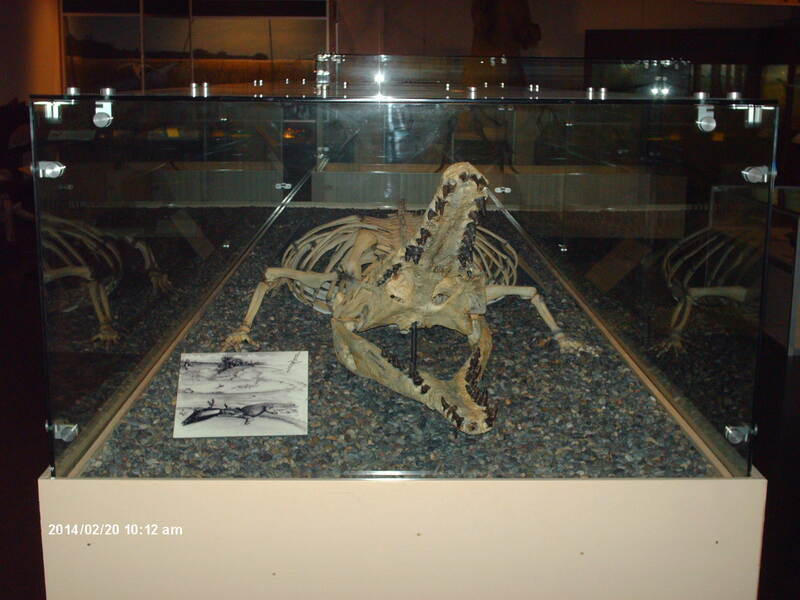 Skeleton of an extinct moa from New Zealand. My wife was impressed with this bird. 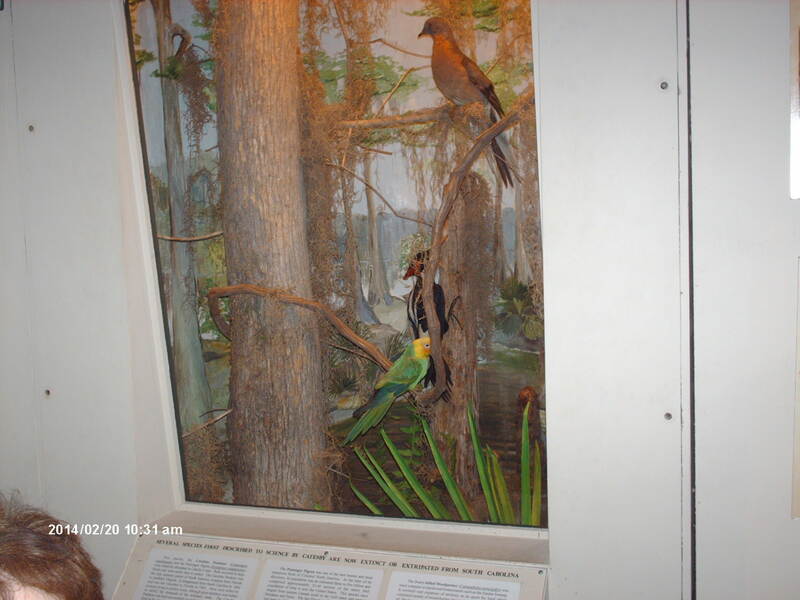 The collection of avian specimens at the Charleston Museum is excellent. Dugong fossil from South Carolina’s late Oligocene or early Miocene. This is the only place you can see these once common birds which are now extinct. The passenger pigeon looks like a big mourning dove and the ivory billed woodpecker resembles a pileated woodpecker but there is no extant species in North America like the Carolina parakeet. 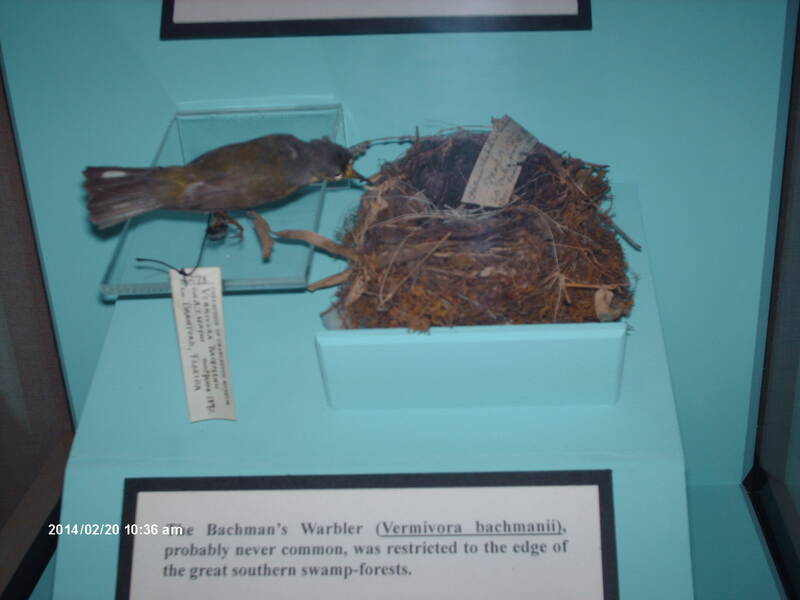 Specimen of the extinct Bachman’s warbler and its nest. This is 1 of only 2 or 3 Bachman’s warbler nests left in the entire world. Painted bunting and green jay. 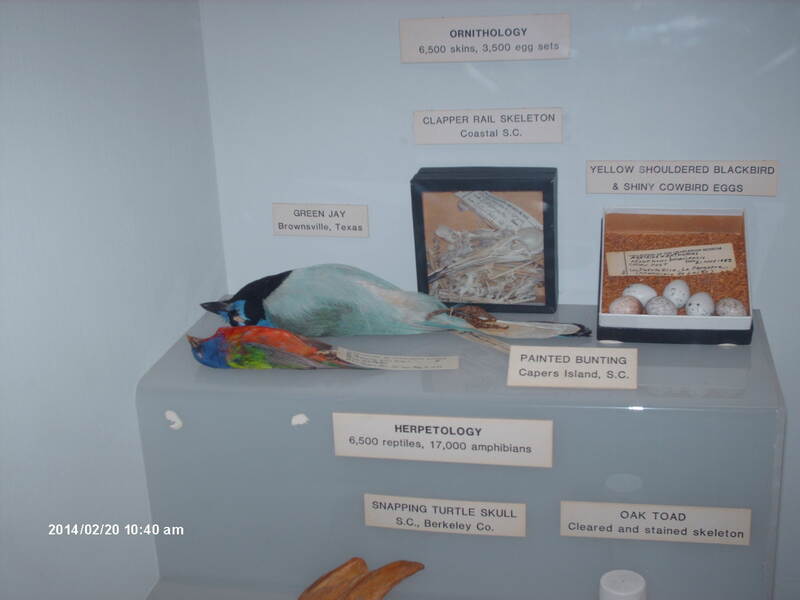 This display case explains that the museum stores thousands of specimens they don’t have space to display. 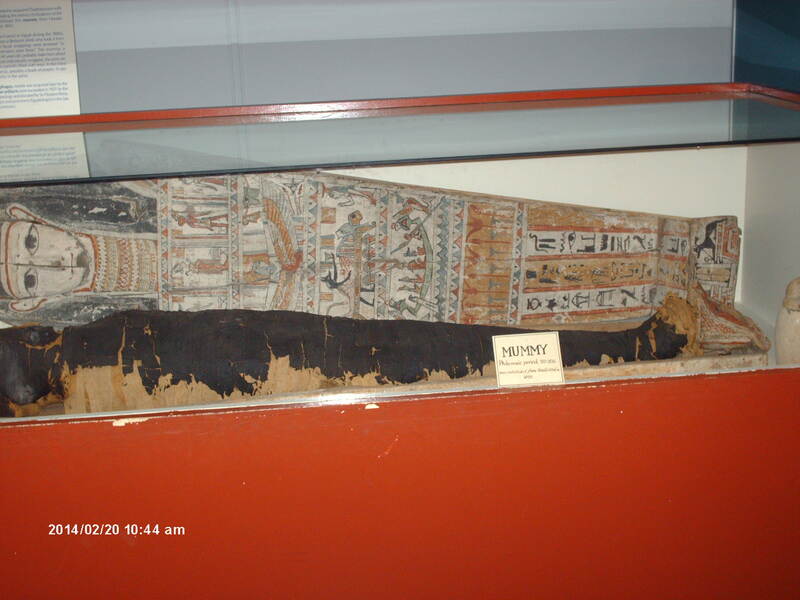 A 2500 year old mummy. It’s the real thing…not a replica. A canjo. 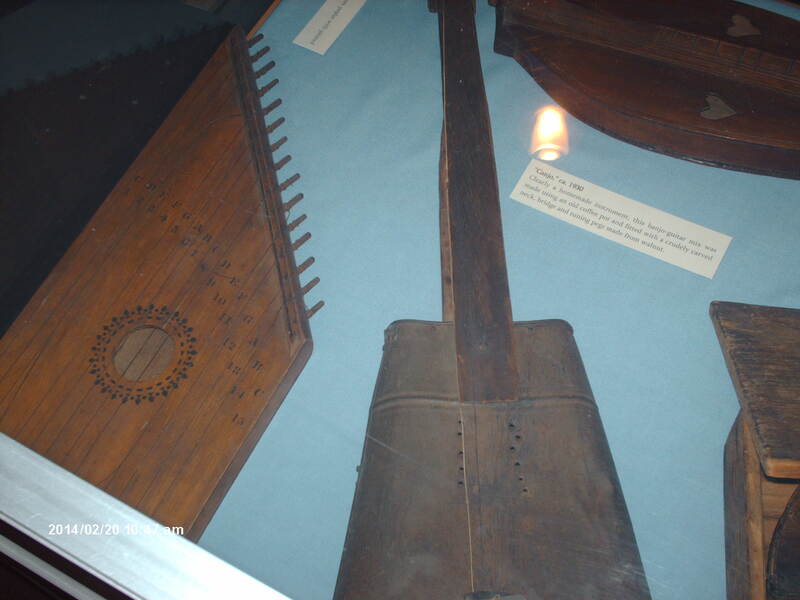 Some ingenius pioneer made a banjo from a tin can. I wonder what songs he could play with this improvised musical instrument. A storm surge from Hurricane Hugo unearthed a Civil War army encampment near Charleston, and all of the excavated artifacts from this site are owned by the Charleston Museum. There is a whole wing devoted to the Civil War, and I was surprisingly fascinated with the displays of historical firearms. They have old fashioned muskets, pirate blunderbusses, and an 18th century fowling piece that looked like a long skinny=barreled shotgun. 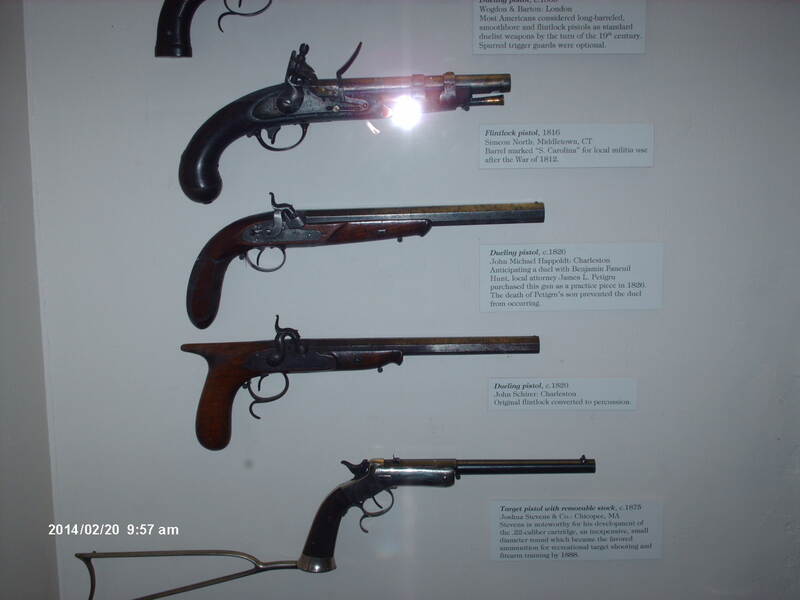 Many of the handguns were literally called dueling pistols. Only “gentlemen of breeding” engaged in duels, but to modern sensibilities, dueling seems like an immature and silly way to settle a dispute. Imagine Mr. Smith calls Mr. Jones a shmuck. Mr. Jones then challenges Mr. Smith to a duel for calling him a shmuck. Both duelists get their choice of 2 seconds (buddies) and a surgeon. I suppose if Mr. Jones wins the duel, it proved he was not a shmuck, but if he lost the duel, it proved he was a shmuck. And if they both shot each other (as occasionally happened), it proved they were both shmucks. I’m not a gun nut but I was more interested in the firearms than I thought I would be. Here is a collection of dueling pistols. Gentleman of high breeding settled attacks on their honor with duels. They were allowed to simply horsewhip or beat up men of lower social status. Dueling sounds immature to me. The last duel in South Carolina occurred in 1880 long after it had been outlawed. 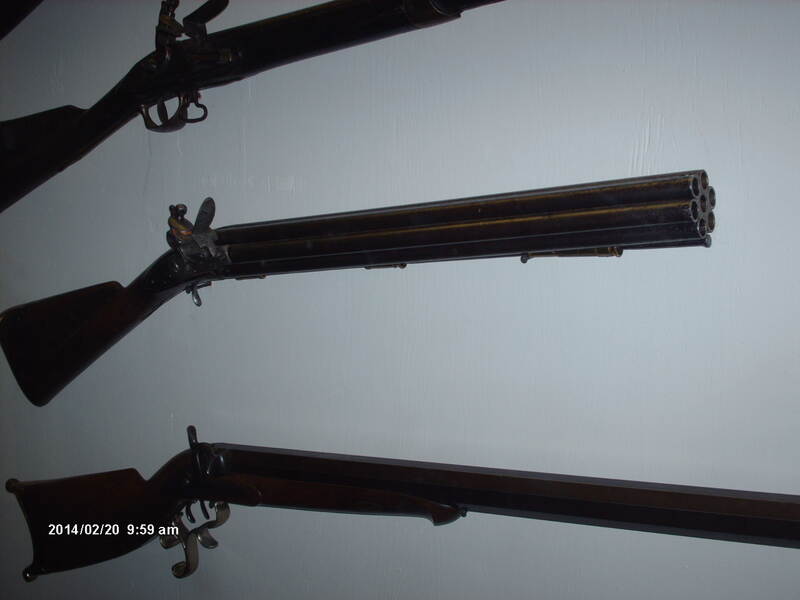 The middle rifle has 7 barrels of .50 caliber. It was used to shoot down sailing masts and would also take out many sailors. Must be fun to shoot. A replica of the H.L. 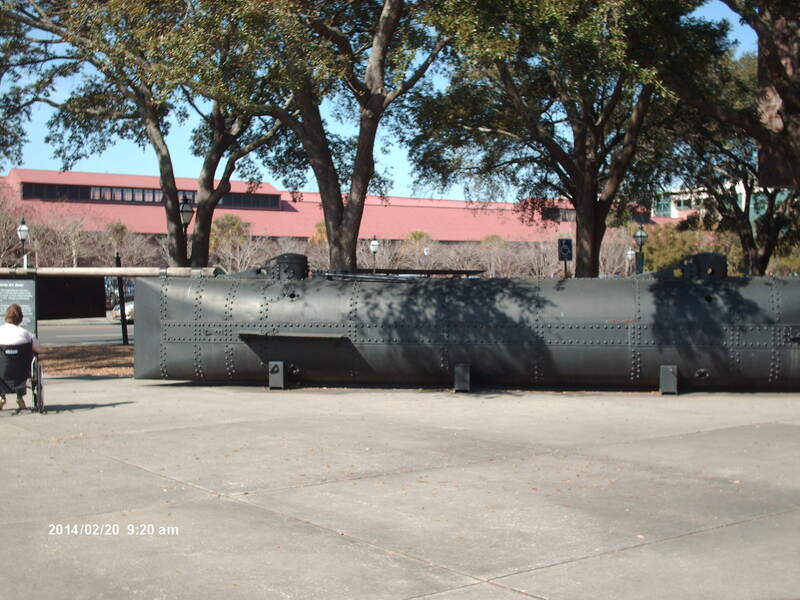 Hunley rests in front of the museum. The original was discovered long after this replica had been displayed. It differs from the real thing in a few details. The torpedo was rammed into the ship. The explosion sank the ship but the sub must have been too close because it sank too. Imagine the stupidity of the chumps who agreed to get inside this contraption. 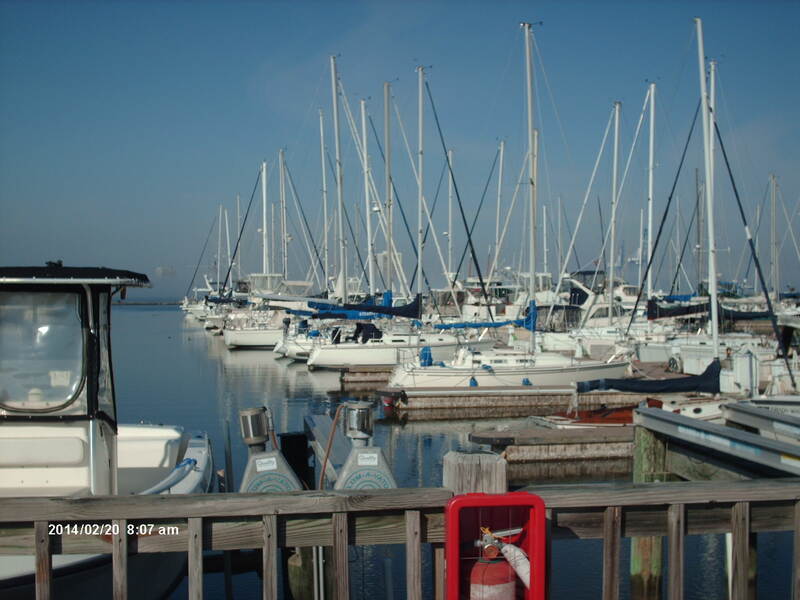 We splurged on our 20th wedding anniversay and stayed at the Charleston Harbor Resort and Marina. 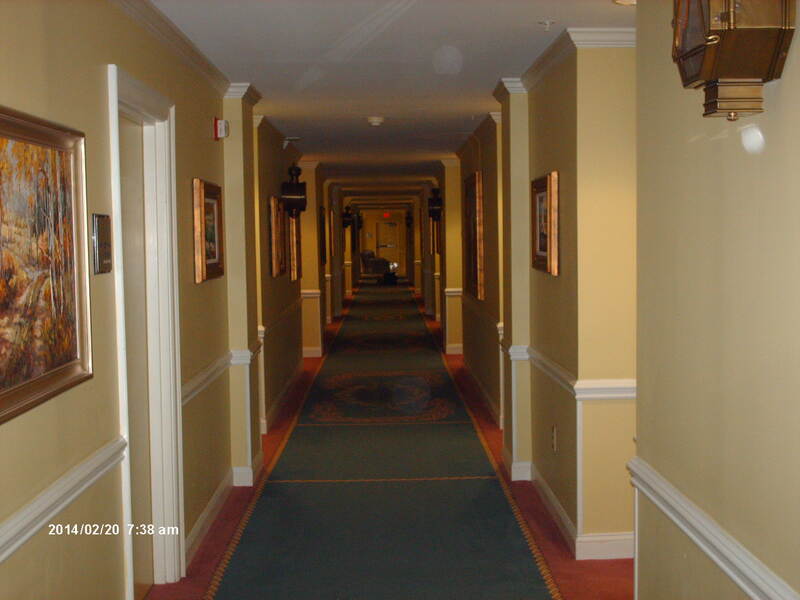 Inside one of the wings of the 4 story hotel. The hotel room was nice, but as soon as I tried to sleep, I noticed the vent in the room sounded like a retching robot. This odd noise was constant. I complained to the front desk, and they transferred us to a nicer quieter room with a view of the harbor instead of a dumpster. I usually can endure a great deal of distress, but I wasn’t going to pay an outrageous price for a room where I wasn’t going to get a good night’s sleep. Driving in Charleston is difficult. After we went to the museum we planned to eat lunch at the Hominy Grill, but I was unable to find an available parking space. Every other street is one way and the traffic lights are posted on the side instead of over the middle of the road, making them difficult to see. I had to watch for cars, frequent bicyclists, pedestrians, and horse and buggies; while navigating this maze of one way streets and oddly placed traffic lights. Moreover, distracting eye candy was everywhere–Charleston has more beautiful women per capita than any other city I’ve ever visited, and the pervert in me had to make sure I checked out all the visible jiggle in my vicinity but without wrecking into the bicyclists, pedestrians, cars, and horses. 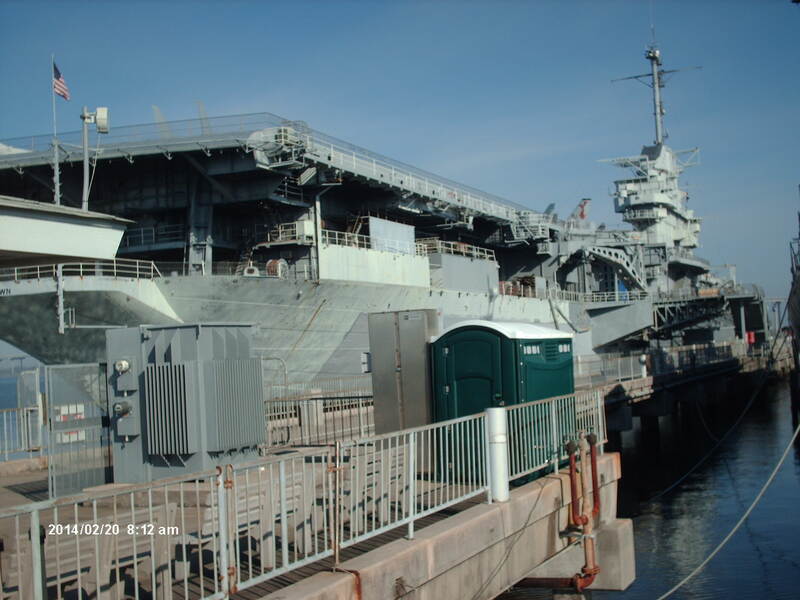 The Yorktown, a famous WWII aircraft carrier, is mothballed and anchored near the hotel. It saw action in the Battle of Midway. The Fish House Restaurant is a 5 minute walk from the hotel. Food is good but priced at least double what it should. I was too tired of driving to look for a reasonably priced restaurant the night of our arrival. Yachts? Big deal. I was more excited about seeing the bufflehead ducks in the harbor. View of the harbor from the balcony of our room. The Ravenel Bridge connects Patriots Point with North Charleston. What an amazing feat of engineering. 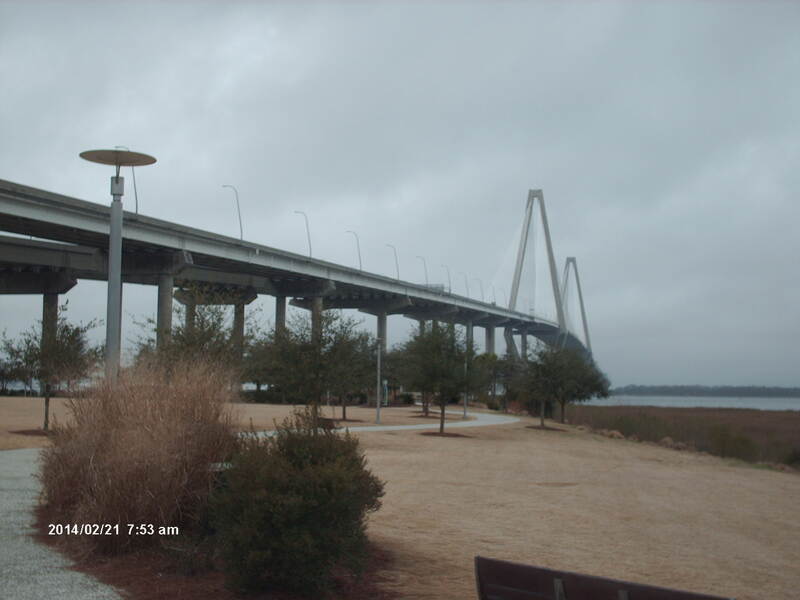 There’s a nice long fishing pier adjacent to the Ravenel Bridge. The pier is made of tabby–a conglomeration of sea shells and cement. The people in South Carolina are friendly, but the state infrastructure is the pits. The roads are terrible and the signs are confusing or absent in some cases. If it was within my power, I’d fire a few traffic engineers and raise state taxes so they can fix their sorry roads. By the time we arrived in Charleston it was late, and I was too tired to look for a place to eat besides the hotel restaurant known as The Fish House. The food was good but wildly overpriced. I paid $21.95 for a plate of fried oysters, mashed potatoes, and collard greens. Salad doesn’t come with the meal, but they do serve soft pretzels with homemade mustard. My wife had crab chops topped with a tasty corn relish. The following day, after we failed to find parking for the Hominy Grill, we ate lunch at a place called Toast. It’s an overpriced sandwich shop, and the dumb waitress tried to convinced my wife that the Cajun mayo with their shrimp wrap was not spicy. My wife doesn’t like spicy food, and of couse the Cajun mayo was spicy. I ended up eating half her sandwich to go along with my oyster po boy. That night, for supper, we found a family style restaurant on Point Pleasant called the Okra Grill that served…okra. I wanted locally caught fish, but I wanted it prepared in a different way than fried because at my age I’ve gotten tired of fried food. Locally caught fish, prepared a different way than fried, was not on the menu. Nevertheless, the food was well prepared, and the prices were reasonable. In fact it was cheaper than our lunch time sandwich shop bill. I had fried flounder, butter beans, okra and tomatoes, and hushpuppies. It was typical southern food, but done well. My wife and I split a banana pudding for dessert. The pristine condition of Wassaw Island, located southeast of Savannah, Georgia, surprises me. It’s hard for me to believe that such a prime piece of real estate has never been logged, cleared for agriculture, or developed for tourism. Before European colonization Native Americans fished and hunted on the island, and they left small shell mounds. They also gave the island its name, Wassaw, which means sassafras; but Anthony Odingsell is the earliest known European to own it. He willed the island to his mulatto son who enjoyed a bucolic existence here with his 11 slaves. Though I’m sure they maintained vegetable gardens and fruit trees, the land was never lumbered nor cleared to grow cotton. In 1866 the Odingsell family sold the island to George Parson, and his descendents used the island as a fishing and hunting destination. One-hundred years later, The Nature Conservancy bought the island and sold it to the federal government for a dollar, and now it is a National Wildlife Refuge. The ruin of a fort erected during the Spanish-American War is about the only sign of man on the island besided a boat dock that provides the only access here, unless one wants to traverse miles of salt marsh, then swim the tidal creek that separates Wassaw from the mainland. Wassaw Island consists of over 10,000 acres of salt marsh, beach dune, interdunal wetlands (See https://markgelbart.wordpress.com/2013/05/14/when-pleistocene-megafauna-roamed-interdunal-wetlands/), and maritime forest. Old growth oak, pine, cedar, palm, and holly dominate the forest composition. There must be centuries old live oaks here. The island provides an unique opportunity to study what barrier island flora was like before European settlement because it’s the only island where feral livestock were never introduced, yet as far as I can determine no botanist has ever studied the flora on Wassaw. Some university professor needs to hire a boat man and survey this rare gem. Photo of the north end of Wassaw Island. The beach is eroding into the forest here but it is building up on the south side of the island. Freshwater wetland on Wassaw Island. Over 200 species of birds have been recorded on the island. During the summer neotropical songbirds swell the avian population, and during winter Wassaw provides refuge for migrating ducks. Painted buntings, rare elsewhere, are reportedly common here. White-tail deer and alligator are the only large animals on the island. Deer were hunted to extirpation on the island, but deer from Wisconsin were introduced, and they brought a northern species of parasite with them. I found a youtube video of a man who sails to Wassaw Island. (https://www.youtube.com/watch?v=cYOsXVSHEC8) He caught a bonnet head shark offshore adjacent to the island. I couldn’t find many scientific studies of the island–it’s notably understudied. I did find a paleotempestology study that determined 9 hurricanes have hit Wassaw Island over the last 1900 years, so it endures direct hits about once every 200 years, perhaps altering the floral composition. 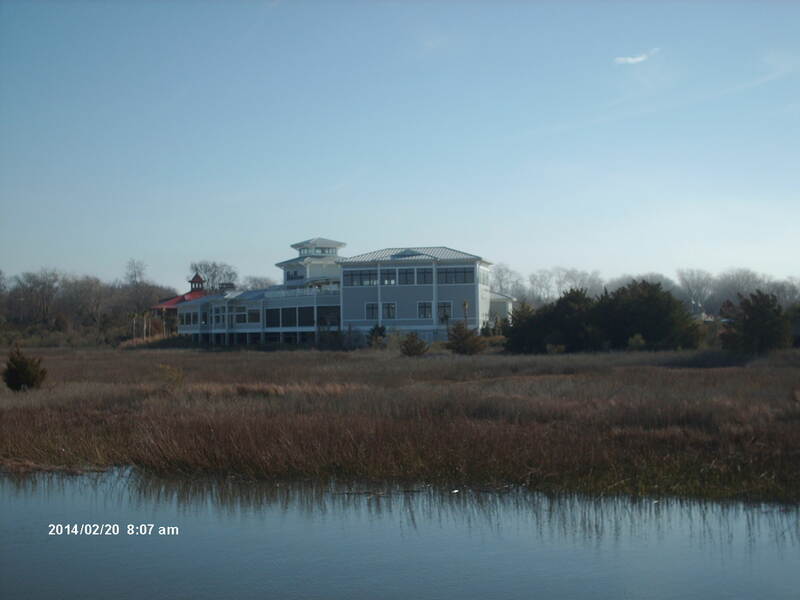 (Scientists can look at sand overwash layers in the salt marsh to determine when hurricanes events occurred.) The response of floral and faunal composition to past hurricanes would be another worthy subject of scientific inquiry. Wassaw Island is of recent origin being in the neighborhood of 7000 years old. It began forming with the rise of sea level that occurred following the dissolution of the massive glacial Lake Agassiz in Canada. Longshore currents are eroding the north end of the island but building the south end. 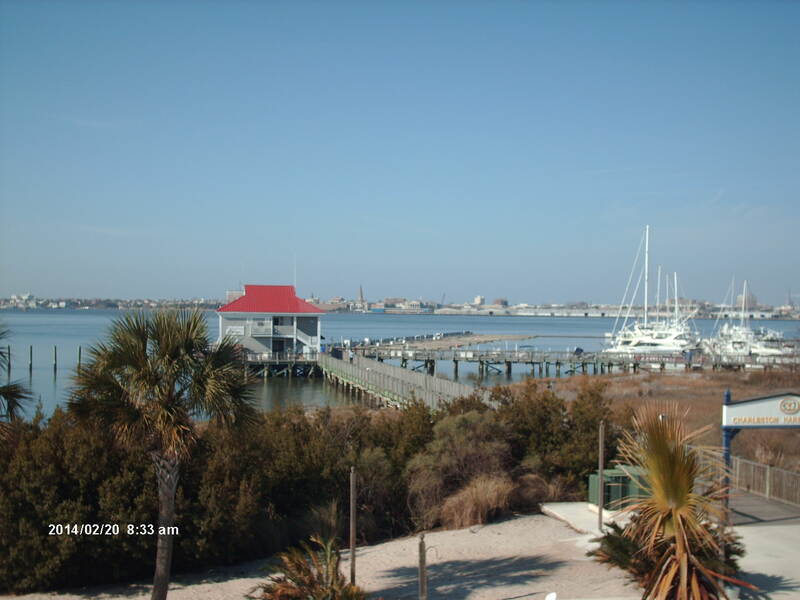 Skidaway Island, located directly behind Wassaw Island, is a Pleistocene-aged barrier island. Skidaway Island is part of what is known as the Silver Bluff shoreline, and it was at sea level between ~41,000 BP-~36,000 BP…before the Last Glacial Maximum. This climate phase was a warm interstadial, the temperatures similar, but probably a little cooler than those of today. The Silver Bluff shoreline formed as sort of a pause in the lowering of sea level during the Wisconsinian Ice Age. 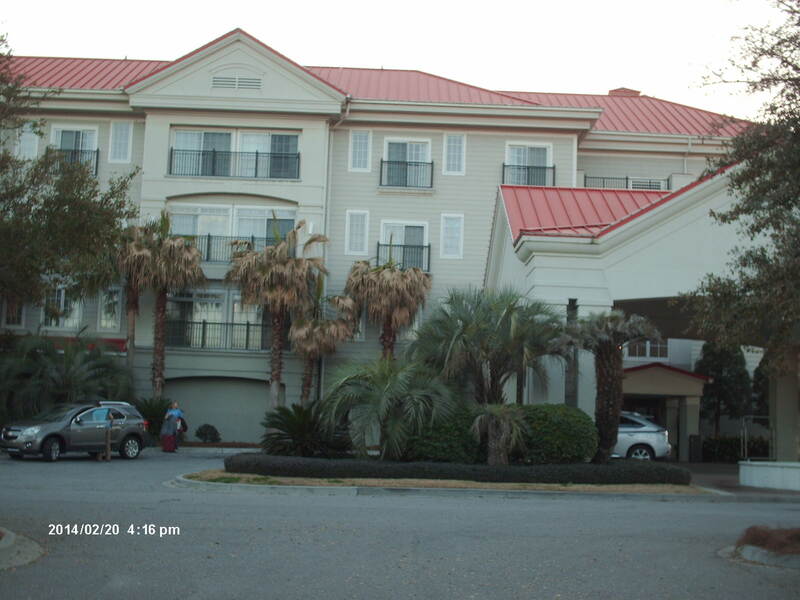 I’ve visited Skidaway Island State Park. There is a nice museum with an impressive fossil replica of the giant ground sloth, Eremotherium. I walked on a nature trail behind the museum and saw live megafauna–a deer in its reddish summer coat. Wassaw Island may be difficult to access for people without a boat, but Skidaway Island was worth the visit. Most motorists driving over the Orangeburg Escarpment probably don’t even notice the gentle decline in elevation that marks the boundary between the upper and lower coastal plain. Most would be surprised to learn this gradual slope is the remnant of scenic sea cliffs that stretched from Jesup, Georgia to Fayetteville, North Carolina. Today, the elevation along the Orangeburg Escarpment lowers from 50-100 feet over a distance of 1-2 miles, but 3.5 million years ago it was a long chain of limestone cliffs, facing ocean waves. These cliffs ranged from 180-250 feet high with the higher cliffs on the northern end. Over time, the ocean has receded to the east and erosion has reduced the cliffs to a barely noticeable slope. The lower figure shows where the Orangeburg Escarpment is located. They are named after a small town in South Carolina. South of this long chain of sea cliffs was a barrier island that was longer than any barrier island currently in existence on the Atlantic Coast of North America. It probably developed from sediment carried by longshore currents eroding away the sea cliffs. Geologists are uncertain about the origin of the Orangeburg Escarpment, but they believe it must be the site of a deep fault where limestone and other rocks were thrusted upward well above the surrounding elevation. This occurred at sea level, and the Atlantic Ocean eroded into the uplifted rocks, creating the magnificent cliffs. An unusually long barrier island existed just to the south of these cliffs. Longshore currents carried eroded sediment from the cliffs, resulting in a barrier island that was far longer than any present day islands along the Atlantic coast. It was 100 miles long compared to the 48 mile long Cape Hatteras, North Carolina which is the longest present day barrier island on the Atlantic Coast of North America. 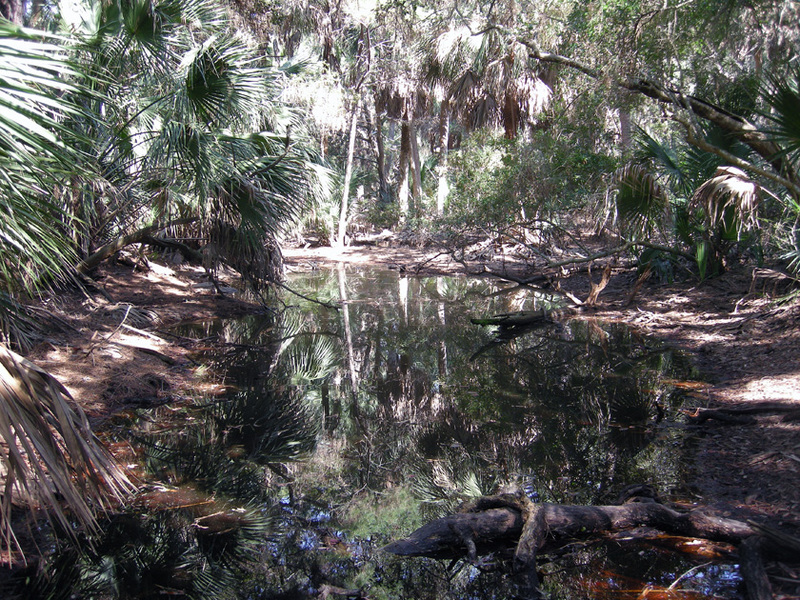 (See: https://markgelbart.wordpress.com/2010/11/19/the-geological-and-ecological-history-of-the-okenfenokee-swamp-part-one/) Today, this former barrier island is known as Trail Ridge and is the geological structure that causes water to backflow into the Okefenokee Swamp. 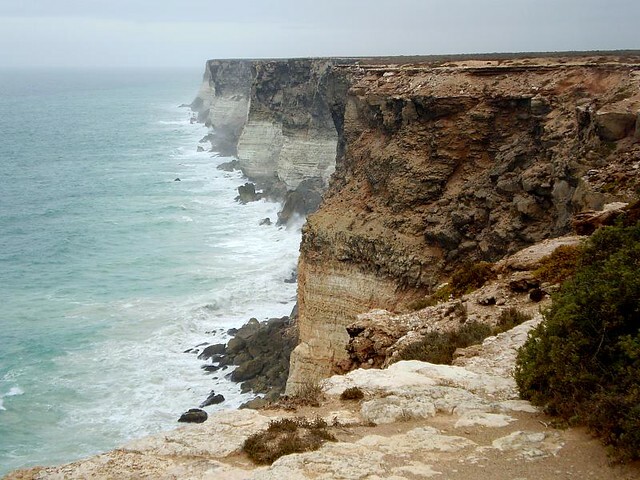 The Bunda Sea Cliffs of Australia. Sea Cliffs similar to this, occurred from Jesup, Georgia to Fayetteville, North Carolina about 3.5 million years ago. 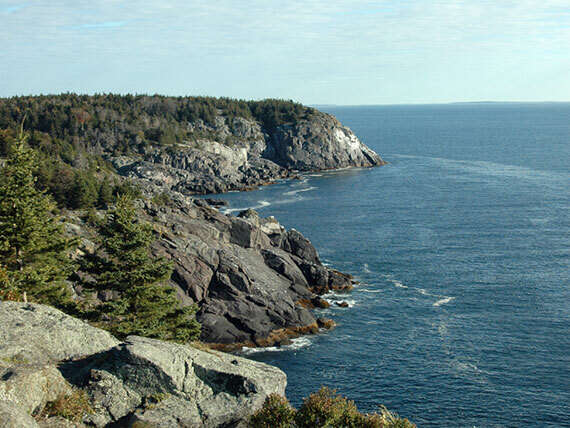 Today, these cliffs are a gentle slope that separates the upper coastal plain and lower coastal plain. People driving over them on state highways barely notice the drop in elevation. 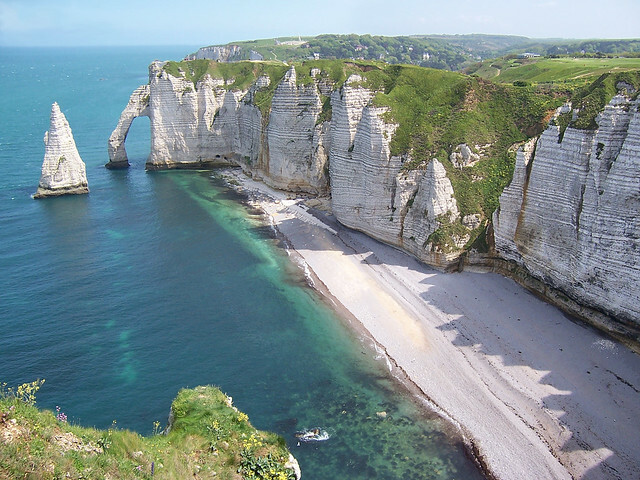 The Etretat Sea Cliffs in France. Sea Cliffs on Moneghan Island, Maine. These are the closest sea cliffs to Georgia today. Hard to believe Georgia, South Carolina, and North Carolina once hosted sea cliffs at least as spectacular as these. Ice Ages had begun occurring during the middle Pliocene when the Orangeburg Escarpment was still young. In between Ice Ages, sea level rose due to the melting of glaciers, and the ocean reached the escarpment. But gradually Ice Ages became longer and more intense and the ocean kept receding more and more to the east, leaving the cliffs high and dry until rainwater eventually eroded them into the flaccid slopes of the present. Subsequent sea level landforms east of the cliffs consisted of barrier island complexes. The natural beauty of the cliffs and surrounding Pliocene-aged wilderness must have been quite impressive. The cliffs undoubtedly hosted dozens of species of nesting sea birds, eagles, and falcons; most of them probable ancestors of present day species. Avian diversity was higher then than it is today; later Ice Ages became too harsh for many species. The ocean in front of the cliffs was completely untouched by man and during most of the Pliocene, water temperatures were warmer than those of today. There were many more species of whales–a major marine mammal extinction event caused by the formation of the Central American landbridge had yet to occur. Carcharodon megalodon, the giant great white shark, still swam the seas. Inland, a cavalcade of large mammals inhabited the land, including 4-tusked mastodons, 3-toed horses, llamas, peccaries, an early species of deer, saber-tooths, the bone eating dog (Borophagus), hyenas, and bears. Just imagine those spectacular sea cliffs located in a completely virgin pristine wilderness. I wish time travel vacations to places like this were possible. This species of 3-toed horse, hyppohippus, became extinct about 9 million years ago, but similar species of 3-toed horses were likely the most common large mammals on the land behind the southeastern sea cliffs about 3.5 million years BP. The Cove Dome, located in west central Georgia, is a round crater. It’s also known as the Woodbury Impact Structure because scientists who are studying this odd geological anomaly strongly suspect it is the result of an extra-terrestrial impact. It is 4.2 miles in diameter and has an elevated quartzite rim, but the rock on the floor of the crater is made of schist and gneiss instead. Merriweather County, site of a probable impact crater. The Cove Dome is located 3.6 miles southeast of Woodbury, Georgia. Satellite photo of the Cove Dome, plus 2 smaller craters to the northwest that are probably the result of the same impact event. The Cove Dome really shows perfectly round on topographical maps. The rim causes so much radio interference that special satellite dishes had to be built inside the crater for cell phones to work.. The sand found in the Cove Dome has similar shock-induced deformations found in other known impact sites. The impact may have melted rocks that when cooled became the crystalized, round, charnocktite boulders visible in the crater today. The unusual psuedotachlytic breccia present here is also evidence of extra-terrestrial impact. 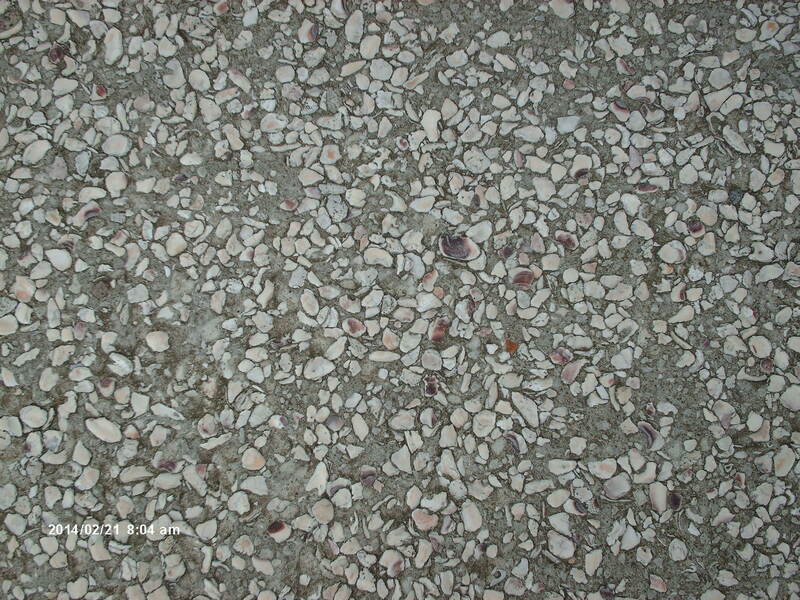 Psuedotachlytic breccia is a glassy fine grained rock often associated with impact structures, however, it’s also found in areas that have suffered earthquake-induced landslides. Scientists haven’t completely ruled out other origins for the Cove Dome crater, but studies are leaning toward impact. Scientists have confirmed an extra-terrestrial impact origin for the Wetumpka Impact Crater in south central Alabama. They found high levels of iridium, an element associated with meteors and comets, and there is also a great deal of shocked quartzite impactites within the crater. The Wetumpka Impact occurred about 80 million years BP when this part of Alabama was a shallow sea. The impact devastated an estimated 830-3840 square miles. The Woodbury Impact is thought to have occurred during the late Cretaceous as well but slightly above sea level. Neither impact was as devastating as the K-T impact which cooked the atmosphere 65.5 million years ago and wiped out the dinosaurs. The K-T impact blew rock and breccia into the atmosphere, and scientists suspect some of it landed on Cretaceous deposits located near Columbus, Georgia because this material doesn’t resemble any of the local rock. The K-T impact crater is off the coast of the Yucatan penninsula in Mexico. Presence of rock blown from Mexico to west Georgia demonstrates what a cataclysmic impact it was. 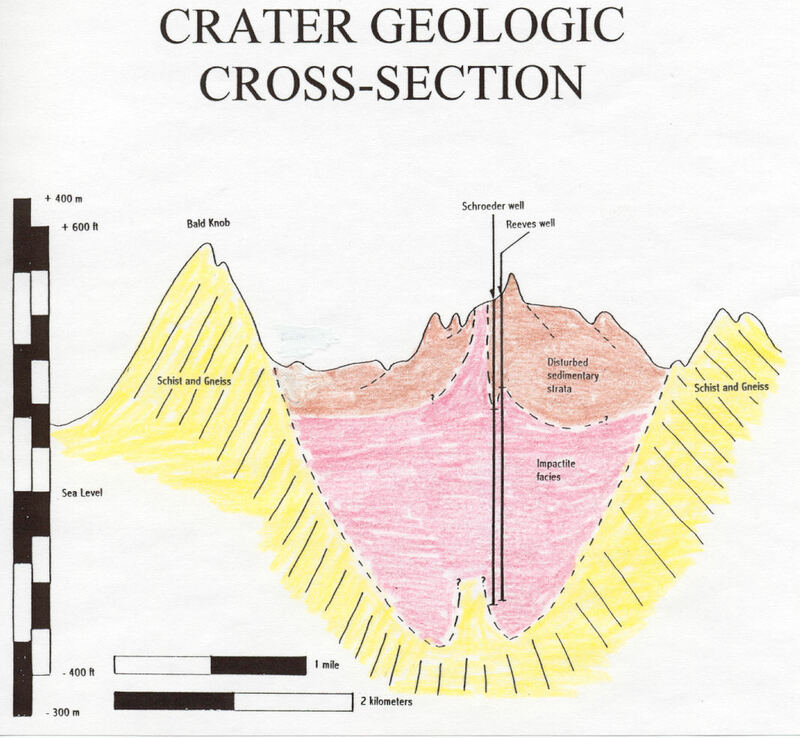 Illustration of the Wetumpka Impact Crater. Another major extra-terrestrial impact occurred in the Chesapeake Bay about 35 million years ago. This impact melted part of earth’s crust and also blew this melted rock into the atmosphere. Many of these melted shards, known as tektites, cooled and fell across North America. The tektites that fell in Georgia and South Carolina are classified as Georgiaites and are found nowhere else in the world. Tektites from the Chesapeake Bay impact that landed in other parts of North America come from a different part of the earth’s crust and are not of the same composition as the Georgiaites. 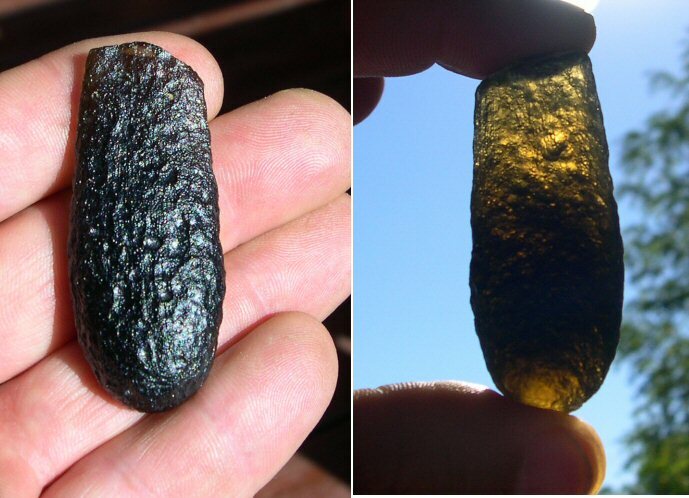 A Georgiaite tektite. It’s translucent green when held up to the light. This map of Georgia shows where Georgiaite tektites have been found. They have been discovered in over 20 counties in Georgia and 2 in South Carolina, but 95% of them have been found in Dodge and Bleckley Counties. Over 2500 have been discovered so far in exposed Eocene age sediments. I’ve never visited west central Georgia, but this part of the state has at least 2 other sites worth visiting besides the Cove Dome: Warm Springs State Park, F.D. Roosevelt’s favorite vacation spot; and Sprewell Bluff which hosts a rare open oak savannah as well as the scenic bluff. These attractions are a little off the beaten path but may be worth investigating. I visited Tallulah Gorge a few years before I started writing this blog, so at the time I didn’t think to write down my observations. I can’t remember where I put the photos I took of that trip or if I even took any. However, I found plenty of Tallulah Gorge photos online. I do remember walking down a long flight of manmade stairs to the bottom of the gorge and on the way down coming face to face with a black vulture that was perched on a ledge. I saw blueberry and blackberry growing on the canyon wall. And I recall swimming in a very cold reservoir nearby. Lately, I’ve been reading a new book, Roadside Geology of Georgia, by Pam Gore and William Witherspoon. Their page on Tallulah Gorge reminded me of my trip there. I didn’t realize Tallulah Gorge had such a fascinating geological history. 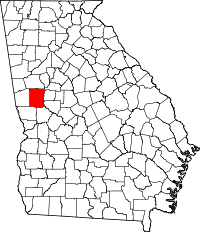 Location of Habersham County. 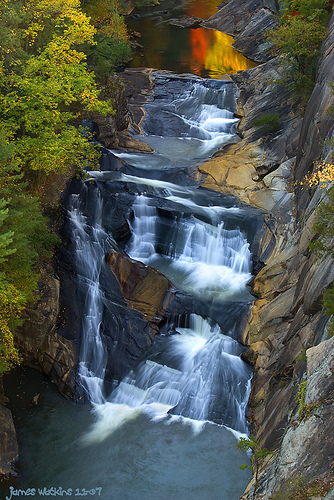 Tallulah Gorge is in this county. The headwaters of the Tugaloo River eroded backwards upstream from the Tugaloo and captured the Tallulah and Chattooga Rivers both of which formerly flowed into the Chattahoochee River. Tallulah Gorge is the 4th deepest gorge east of the Mississippi. Tallulah Falls. The sudden drop in elevation when the Tugaloo River eroded backward into the Gainesville Ridge created these falls. The Gainesville Ridge separates the Chattahoochee River drainage from that of the Savannah River. All streams on the west side of the ridge empty into the Chattahoochee River, while all streams on the east side of the ridge flow into the Savannah River or its tributaries. 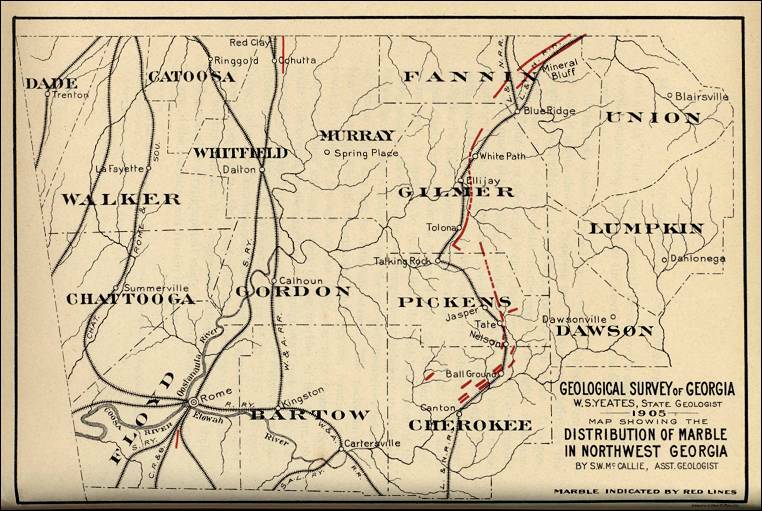 Formerly, the Chattooga and Tallulah rivers were tributaries of the Chattahoochee River. But the headwaters of the Tugaloo River eroded upstream into the Gainesville Ridge capturing the Tallulah and Chattooga Rivers. These 2 rivers changed course making a sharp right angle turn through the Tugaloo River which empties into the Savannah River. It’s a classic example of what geologists refer to as stream capture. Geologists believe this stream capture event occurred “recently”, but I haven’t been able to find any studies of the exact age of the event, and I think scientists have not determined the exact timing of this dramatic occurrence. Recently in geological time could be 10 million years. 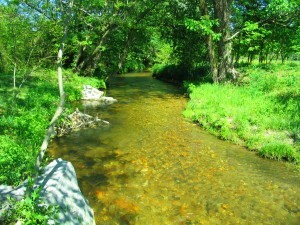 Nevertheless, scientists believe the steepness of the gorge is evidence the stream capture occurred relatively recently. Some of the cliffs are 600 feet high. Geologists believe the gorge is geologically young because not enough time has passed for the high cliffs to erode away. In older river and stream incisions, water eventually erodes the sides back, creating broad gently sloped valleys. But at Tallulah Gorge, not enough time has passed for this to happen. The rock along Tallulah Gorge is made of erosion resistant quartzite which is sandstone that has been metamorphized. There is no Chattooga River gorge because the rock along that river is less resistant to erosion. When the Tugaloo River eroded backwards and captured these 2 tributaries, the elevation suddenly lowered, creating the falls. This change in elevation is the reason the Chattooga river is known for its white water rafting. There are 2 types of environments in the vicinity of the Tallulah Gorge. The cliffs provide nesting habitat for many species of birds (See https://markgelbart.wordpress.com/2013/05/19/piedmont-cliff-ecology/). In pre-Columbian times bald and golden eagles and peregrine falcons likely nested here. An acidic pine/oak woodland and forest grow on the rim of the gorge. Plant species composition includes white pine, Virginia pine, table mountain pine, pitch pine, shortleaf pine, southern red oak, rock chestnut oak, scarlet oak, blackjack oak, red maple, sourwood, persimmon, mountain laurel, rhododendron, blueberry, and greenbrier. This is the southernmost range limit of the Carolina hemlock. Monkey-faced orchid and persistent trillium are rare plants that favor this moist, water-splashed environment. The Soque River may be a remnant of the Chattooga and Tallulah Rivers before they were diverted from the Chattahoochee River Drainage to the Savannah River Drainage. This is a beautiful small river with little public access. Deep Creek and the Soque River are likely remnants of the Chattooga and Tallulah Rivers before they were diverted from the Chattahoochee River Drainage. There are many species of mussels common to both the Chattahoochee and Savannah Rivers. The Tugaloo stream capture event must explain how bivalves from the Chattahoochee Drainage colonized the Savannah. For a while during this stream capture event, water must have flowed from the Savannah to the Chattahoochee as well because mussels originating from the former also made it to the latter. However, it’s not clear how thie mussel exchange from the Savannah to the Chattahoochee occurred. The land area known today as Georgia has been shaped by multiple continental collisions. Hundreds of millions of years ago, a vast ocean separated 2 supercontinents–Laurentia and Gondwanaland. Georgia was part of the former. Volcanoes emerged in the fracture between the 2 continental plates, creating islands. Some of these islands collided with Laurentia in the region that was to become Georgia. This caused the uplifting of mountains as the islands pushed over the landmass of Laurentia. The 2 supercontinents, influenced by the earth’s rotation, slid over the earth’s mantle and drifted toward each other. First, the continental shelf of Gondwanaland struck Laurentia, then the 2 supercontinents themselves collided. Both of these collisions caused the uplifting that birthed the Appalachian Mountains. Later, the 2 supercontinents rifted apart and drifted in opposite directions, creating a massive rift valley that became the Atlantic Ocean. In the process Gondwanaland left a piece of Africa behind in Georgia and South Carolina. The continental collisions spurred much volcanic activity. Volcanoes produce molten lava which when cooled becomes igneous rock. Water erodes igneous rock into sediment that eventually can become cemented together into sedimentary rock. Geological processes of subduction can cause both igneous and sedimentary rock to become buried deep underground where it is exposed to great pressure and heat, changing the rock’s composition or, in another word, metamorphizing it, hence the name, metamorphic rock. Metamorphic rock also erodes into sediment that can eventually become sedimentary rock. This is known as the rock cycle. Marble is a metamorphic rock that originated from living organisms. Animals with shells made of calcium carbonate, such as clams and snails, first evolved about 500 million years ago. Shells of countless numbers of these organisms became buried and cemented together to form limestone. Limestone subducted deep underground becomes exposed to high pressure and heat, changing its composition to marble. Millions of years later uplifting and erosion expose these marble veins to the surface. Georgia has some of the best marble in the world. Map of the Murphy Marble Belt in Georgia. The red lines indicate where the marble outcrops. Marble is relatively rare on earth because it couldn’t have become metamorphized limestone until after organisms with shells evolved. The Tate House made of pink Etowah marble. Sam Tate consolidated the Georgia Marble industry early during the 20th century and had this mansion built for fancy living. No paint was necessary to give the house this color. It’s located near Nelson, Georgia where there is a schoolhouse made from marble and a marble museum. The area where marble outcrops in Georgia is known as the Murphy Marble Belt. The Cherokee Indians made use of marble, but Europeans forced them off the land and established the marble industry. (Historical footnote: the Supreme Court ruled in favor of the Cherokee Indians, but the U.S. government ignored the Supreme Court ruling and forced them to leave the state anyway, leading to the infamous and tragic Trail of Tears. President Andrew Jackson hated Indians.) Marble is resistant to water erosion, yet is soft and easy to carve, making it ideal for building materials and for sculpturing statues. There are 3 types of marble in Georgia: Cherokee white, Etowah pink, and Creole gray and white. The gray in the latter is an impurity of clay that mixed with the limestone before it became metamorphized. The Murphy Marble Belt in eastern Georgia consists of 3 kinds of metamorphic rock–quartzite, limonite iron ore, and marble. This apparently corresponds to geological strata in western Georgia that did not get subducted and metamorphized and instead consists of 3 sedimentary equivalents–sandstone, iron ore, and dolostone (a type of limestone). You are currently browsing the GeorgiaBeforePeople blog archives for February, 2014.